This is the second half of my article about biofield tuning. 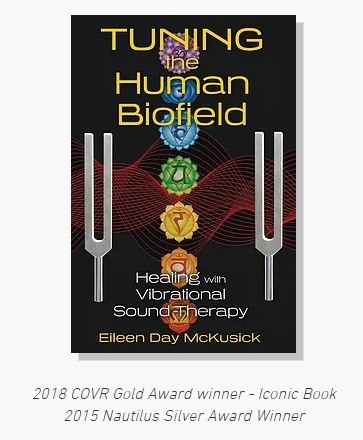 In the first article, Eileen McKusick, the researcher who originated biofield tuning, introduced us to the basics of how the sound from tuning forks can be used to discharge stuck energetic patterns in the biofield that surrounds the human body, so that physical and emotional health can be restored. You may wish to read the first article to learn about the techniques of biofield tuning. The answer to this question involves complex scientific principles of physics. This is a brief summary of the information Eileen McKusick presented in her book, Tuning the Human Biofield: Healing with Vibrational Sound Therapy, 2014. See the chapters on plasma and ether for the full details. Most older people were taught that once a space craft exits the atmosphere of Earth, it enters into the nothingness of “outer space.” Many of us were taught that “space” is empty and void of everything except perhaps for a microscopic speck of dust or two. As it turns out, there has been intense scientific debate and exploration of the nature of space over the last hundred years or more, which has proven that space is not an empty vacuum, but it is completely filled with plasma. Plasma is the fourth state of matter that lies beyond solids, liquids, and gasses. Sometimes it is called hot gas, but that is an unfortunate misnomer. Plasma is thought to consist of matter out of which gasses, liquids, and solids are able to form. When you observe lightening, you are observing the activity of plasma. When you see the northern lights arcing across the northern skies, you are seeing plasma in motion. Plasma is actually used in medical applications to sterilize equipment and to promote wound healing. Plasma does not just sit still, it moves and establishes waves and structures. It literally builds forms that are invisible to the eye and which persist over time. The plasma that physicists study is everywhere in the universe. We are surrounded by it. However, we are also surrounded by bioplasma. This is a unique form of plasma that is created by living organisms. It is built up through the processes of life that occur within us. It has qualities that reflect the electrical activity in the body, the magnetic activity in the body, and the sound activity of the body. Bioplasma forms standing waves, structures, and pathways through which energy moves and flows into and around the human body. In the case of illness, the human bioplasma contains structures that impede the healthy flow of energy. These areas of turbulence and blockage can be thought of as chaotic wave forms, which drag us down, and if left unaddressed, will lead to serious illness. The size of the human biofield extends approximately 6 feet to the left and right of the body and 2 to 3 feet above the head and a similar distance below the feet. The limits of the biofield can be measured by the activity of a tuning fork. It is possible to detect the presence of the biofield by listening for changes in the sound produced by the tuning fork as it is moved into the biofield. It can also be sensed in the hand by feeling for changes in vibration. Eileen McKusick has developed a literal map of the human biofield, which shows where different types of memories are stored. When there is tension around a specific traumatic memory there will be impaired flow in the biofield. Impaired emotional and physical health are determined by these distorted and tension-filled memory regions. If there are many areas/memories where energy does not flow properly, then this weakens the health of the person. If these patterns persist for many decades, then physical illness will be driven deep into the body and life-threatening conditions result. This means that the distortions in the biofield that are linked to traumatic memories can be released through vibration. Biofield tuning brings the pure frequency vibration of sound from a tuning fork into the specific locations where traumatic memories are located in the biofield. This provides an opportunity for the body to re-establish coherence and flow, thus discharging the memory and its harmful effects on emotional and physical health. I interviewed Eileen McKusick at the end of 2018. The following quotation and the others in this article were all obtained from that interview. 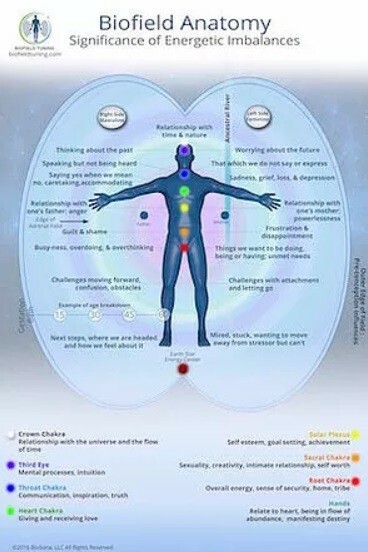 Energy tends to flow along established pathways and that’s how we get stuck in our bodies and our minds. We can help the body and mind to establish new rhythms and patterns and flows, and this is the foundation of good health. For additional background information about the biofield and biofield tuning, Eileen McKusick recommends this presentation on the YouTube Thunderbolt Channel. As was discussed in the previous article on biofield tuning, most of us acquired traumatic injuries during childhood resulting in memories that are marked by turbulence and dysfunction. These traumatic memories can result from physical/emotional/sexual abuse, emotional and physical neglect, accidents, frightening experiences, and various other kinds of injuries. Such turbulent memories produce a wide range of feelings that accompany us throughout the rest of our lives. These emotional patterns often appear to have a life of their own, which may be disconnected from the reality of current events in our lives. They distort our perceptions and cripple our relationships with people. They lead to distorted self-image. They are a fountainhead for undesired anger, fear, resentment, bitterness and other emotions. In part, the aggregation of our turbulent memories sets us up for developing addictions of various types. As young people, we develop strategies that will suppress the feelings that plague us, and that will help us forget the memories that produce those feelings. Of course these strategies will eventually fail, and we will turn to all manner of addictions to manage the unwanted feelings. What I have found with addictions – it really isn’t so much about the substance – it is about the emotions that we are managing with the substance. I am a recovered sugar addict. I used to manage anger with sugar. In my late teens and early twenties I convinced myself, as a spiritual person, I didn’t get angry. Eventually, I ended up with a terrible case of candida, which happens to a lot of sugar addicts. In order to treat the candida, I needed to get off sugar. What I discovered was that every time I felt angry I had been interpreting that as a sugar craving. So all this anger started to come up and out of my system as I tried to quit sugar. We can manage boredom. We can manage sadness. We can manage anger. We can manage all kinds of things if we put ourselves deep enough into a carb coma or sugar coma. The trouble with food is that you have to eat. You have to learn to master the nuances of food. You can’t just quit cold turkey like you can with pretty much anything else. And that is an extremely difficult thing to do. I have observed that a lot of people who are addicted to sugar were bottle-fed as infants. Many got Karo syrup and condensed milk and things like that – very sugary substances. We have learned to equate sugar with comfort – sugar with love – sugar with feeling good. I might think I want a drink or I think I want a brownie, I think I want this or that. [As addicts, we have to ask], what emotion is underneath [the addictive desire] that is asking to be felt, that is asking to be expressed, that is asking to be validated. Once we settle down the emotions [by clearing the biofield] that are driving the addiction then the impulse to continue to use that substance starts to dissipate. But you have to be brave enough and courageous enough – and be willing to let the pain surface – and move through it. And that is not easy for folks to do. It is uncomfortable. But once you get through that and you come out the other side then you will have the experience of freedom that you have been craving. We want our actions to come from a place of pleasure and enjoyment not compulsion and suppression. I believe on some level everyone knows what their mission is. What I have observed is that the mission of most people is more grand and great than they feel worthy of owning. Most people are plagued with all kinds of mind viruses that tell them that they are not worthy – they are not good enough. It is important to understand that these are programs – we are very much like computers that get programmed with information and this becomes our operating system. What I have discovered is that everyone – without exception – and I have worked on thousands of people – that when you get the noise out of their signal, there is this beautiful pure tone – beautiful harmony – and there is greatness present. As we get the noise and the drag out of the system, we step into that sweet spot where we just naturally flow into whatever our mission is. We start to give ourselves permission to follow our natural inclination to speak our truth, to walk away from abusive situations, to honor the gift that we have been given, and to start to feel worthy to bring those gifts out into the world. If you are in a place where you don’t know what your mission is, then at least get your health meter up, because anytime you are going to go into a battle whatever that looks like – and certainly Planet Earth is a bit of a battle zone – we want to have our health meter high. Make a commitment to take care of yourself – to start feeling healthy and strong and to feel good about yourself. Once your health meter gets up to where it needs to be, then the mission will present itself. Part of the reason we are doing scientific research is because I love science. I thought I was going to explode with joy because I was able to quantify the effects of my work. This was particularly satisfying. Since then, I have done work with a number of devices and different kinds of experiments. I am currently working with a team of PhD researchers who have already published peer-reviewed papers on the biofield. We have spent the last two years developing a study to test the hypothesis that memories are found in the biofield. I set up a non-profit institute to receive grants and donations to support the science. We are not taking all this on faith. We want hard science. We are making a paradigm shift. People are really getting it that everything is vibration – everything is just fields of energy and information. There is a dawning awareness about the therapeutic power of sound. We found that biofield tuning is not good for people who were very, very ill or for people who are in palliative care or dying. It is just too strong. It is asking the body to detox, to release, to process, and to digest. If the detox pathways are all gummed up then illness has gone deep into the body and this creates a lot of discomfort without necessarily much release. Biofield tuning is helpful for mild to moderate anything. Mild to moderate pain, mild to moderate anxiety, depression, and even things such as MS, Parkinson’s, diabetes, and seizures. None of that is contraindicated. We have contraindications if people have implanted electronic devices – pacemakers or implanted pain devices. Anything with electronics can go haywire. It doesn’t always but it can. Biofield tuning is also contraindicated in pregnancy. It is contraindicated because we just don’t know what the effects are on people who are pregnant, and I feel it is unethical to experiment to figure that out. We recently had space open up in the building where our headquarters are located and we opened a clinic. So now I have a number of practitioners who are working in the clinic seeing people in person and at a distance. Even my 17 year old son has been an apprentice and has gone through the training. He is now seeing people in the clinic and he is wonderful. So if anyone is in the Burlington, Vermont area, you can come by the clinic and get a session. I no longer work one on one. I switched to working on groups at a distance, as odd as that might seem. I know it sounds ridiculous, but I wouldn’t be doing group sound healing sessions at a distance if I hadn’t gotten tons of positive feedback. I sent out a survey this morning for the session I did last night that addressed pain. I have gotten testimonial after testimonial from people who listened to the session and now have less pain. So, I see ample evidence that these group sessions work. Eileen McKusick’s book is available from the biofield tuning website (among other places). My intention is to move our understanding of the biofield and the power of sound forward on many fronts. The book is full of scientific and historical references. It can be used by anybody who is writing academic papers on the field. It provides detailed information about the biofield anatomy map. The book has won a couple awards and it is selling really great. You may wish to visit Eileen McKusick’s YouTube channel for additional information. It is possible to learn the basics of biofield tuning with a home study kit. I have been developing my skills by using tuning forks on myself, my wife, and friends. This kit can be thought of as a first aid tool for helping people get out of pain and discomfort. The home study kit contains the set of 5 biofield tuning forks, the biofield tuning book, instructional DVDs, and other tools. Professionals with a practice can use the kit to integrate biofield tuning into their existing work. Another option for beginners is the Sonic Slider. This fork has a slightly longer handle, which is designed for self-use. The handle can be slid across the body or the stem of the fork can be set on places that have pain. I use the Sonic Slider to stimulate lymphatic drainage from the head and to treat neck and head pain. People who receive biofield tuning feel lighter. They say they can breathe better. They say they are more relaxed. Biofield tuning improves your resilience and your ability to cope with stress. We can’t take stress out of your life but we can improve your ability to manage that stress. I have seen so many people get out of pain, I have seen so many people overcome anxiety. I have seen so many people step into their own power. So much of what we are burdened with is our story. It can be a story of victimhood, not being good enough, stuckness, or the story of being dealt a bad hand. These are just stories. They are just a perspective – they are just a pattern in your field. Biofield tuning is based on the premise that we are basically packets of wave forms – we are light and sound – vibration. So working with vibration makes sense. It is logical to treat vibration with vibration. There is nothing about this work that is metaphysical, paranormal, or even quantum. This is just Newtonian physics – of resonance and entrainment. The tuning fork initially resonates with whatever perturbation [noise and resistance] that is present, and because it is producing a strong signal of coherence, it entrains the body into a coherent expression. * “Eileen McKusick explains the premise of the Biofield Anatomy Hypothesis,” YouTube, 5/27/2017.